Owl Things First! : S'more Jesus! I got to give the children's message in church this week. I love giving the children's message...as soon as it's over! Like most things that I teach, I learn more than the students. Preparing for a five minute message takes me about five hours. I believe God's word is a living testimony of His love for me, so what a blessing it was to spend time finding treasures of truth to share with three and four year olds! I knew I wanted to do something with S'mores because what catches kids attention like food?! I couldn't find anything about Moses roasting marshmallows at the burning bush. or the israelites roasting them at the pillar of fire. I searched the new testament for stories about S'mores...No luck. I could find fish and bread. Paul and Silas never had S'mores in jail. I was sure when I typed Bible devotions S'mores something would come up that I could adapt to my message...Nope! I passed out bags of everything the cuties needed to make a S'more at home along with a paper to guide their S'more time. They always get stickers so I threw a couple of those in, too! Then I forgot to give them the magnet I had made them! I found them all after worship and gave it to them then. One of them thought the bird had a sword and was ready to have a sword fight, so it was probably better that I forgot! Click on the picture if you would like your own guide for S'more time at home. I'm off to enjoy one of the most beautiful days Michigan has to offer. No school work for me today...I'm taking a Sabbath rest! 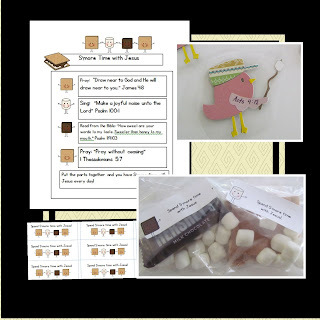 After writing this post, I did S'more searching for S'more resources. I'm so excited to have found this gem! It is in my cart at Amazon and I can't wait to get it! It will be a great parent resource in my room! Sorry for saying there wasn't much out there. I just wasn't using the right search words. Perhaps God wanted me to search through his word S'more myself. I'm so glad I did! 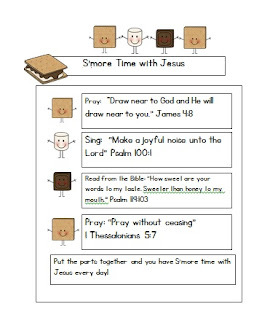 That's the funny thing about God's word...I never wish I hadn't spent S'more time with Him! Fabulous message in a delicious format, and one sure to stick to their hearts as well as their ribs! Thank you, Anonymous! I love the way you put it!! How adorable. I'm so going to "borrow" your lesson. May have to send this one to Mrs. Amanda for our children's church. Love it. Thanks for sharing. I teach at a private Christian school and I am going to share with the elementary staff. What a cute idea! I love Scrappin' Doodles. That's a sweet lesson! I taught adult Sunday school last weekend, and it took me all day to prepare for 40 minutes of talking. Yikes. I love this S'more idea - we are planning to use it at our church's fall festival trunk-or-treat! Looking forward to more creative ways to spread the Word! I am planning to use the S'more idea for a kids campfire night. Will be adding a craft kit i found on oriental trading and the song "I want S'more of Jesus"